- First up, you want to create the auto-import folder in the Finder. 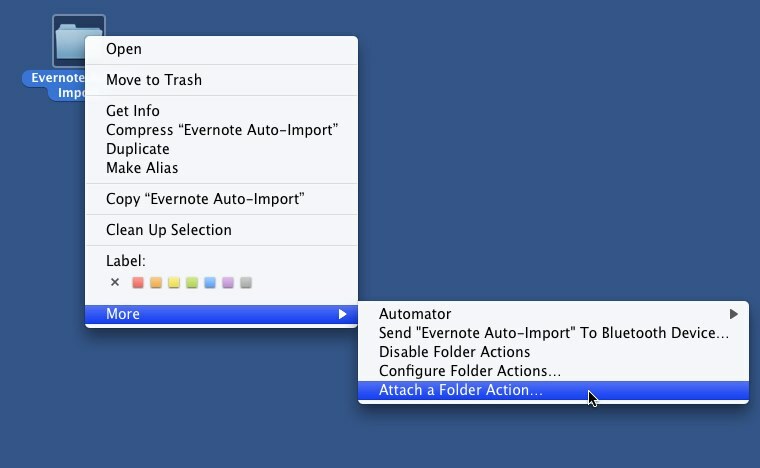 For this guide, we'll create a folder on the Desktop called "Evernote Auto-Import". property done_foldername : "Clip Successful"
property failed_foldername : "Clip Failed"
-- uh oh. bad things happened. Now choose the script we just created, and that's it! Yer ready to go. Drag an image or file into the folder to try it out. If the clip is successful, the file gets moved into a sub-folder called "Clip Successful", and if it fails, it goes into a sub-folder called "Clip Failed" and the Finder will display the error message. So, no matter what type of file I attempt to copy into this folder, I get an "Unsupported file type for clipping" error. What are the supported file types for this operation? While not quite as useful as I thought it might be, still a nice script. There are times I get text files that I wish to upload to Evernote. I thought I would just be able to drag copies of these files into this folder and the action would upload it nice and neat rather than opening the file, copying, pasting to Evernote and closing the file. Any reason this type of functionality couldn't be supported? Hi Steve. Text files should also be handled ok. I just tested this with a file called "Foo.txt" and it works ok. What's the name of the file you're trying to auto-import? The filenames varied from "test.sh" to "test.java". I didn't actually try a file with a .txt extension, but rather files that were of type plain text. Is the ability for Evernote to import a note based on the file extension and not the datatype? I'll file a bug to add support for this metadata. I can see where in the script to deal with the 'Auto Import' part but how do I just get the filename instead of the whole path? Actually, plain text files are supported ... we just automatically convert them to HTML internally. ohh ok that is great. For a second I thought that there was no txt support. I have one more question. I have alot of files(over 700) that are text files but they have different extension which I use another app to create. Is there a way to force EN to recognize that format as plain text? They are plain text files, just holding adifferent extension. I can do one time renaming but I am constantly updating those files and adding new ones and I would like to implement those files into EN dynamically. Right now, we only use the extension on the file to determine its type. This means that files with a random other extension won't be processed automatically unless you rename them. Like Geech says, we plan to try to expand this behavior a bit in the future, for files that identify themselves as plain text. Why isn't this supported within the program itself? It's unacceptable to pay $45 for a premium account and not have something so basic supported. Same reason as always: we haven't had time to fully develop and test it yet. Now that AppleScript support is in, we can work on it. Notice that 1.1.6 didn't contain any fixes in this area. What's the current timeframe look like for including this feature? (using data type rather than file extension). i did this. created a folder "Evernote Auto-Import" in my Documents folder. Enabled folder actions. Created the script that is also stored in Documents/scripts folder (stores as scpt). And then did the attach script as advised. Attached is an image to show what I did. But nothing happens after I put files in this folder. No fail, no success! What am I doing wrong? I think your folder isn't working because you have the right box filled in. From what I understand, if you put something in that "on" box, the folder action "auto-import", in this case, will only activate once that other script is called. Simply get rid of that other script, and you should be good. Also, everyone, keep in mind that this only auto-imports on Evernote's startup (from what I can tell). So if you send something to that folder while Evernote is open, nothing will happen. hi. i am afraid i did not understand what you mean when you say get rid of that. i tried un-checking the script "on" option first. that did not work. then i unchecked the folder and checked the script that did not work either. is it possible to restate the steps with more granularity in the "attach script" step? Yeah...sorry about that. As I was writing it, I thought "what the heck am I saying?" Anyway, good news. I will restate what I said, and I also finished version 2.0 of my HP 6200 scanner workflow. Why do you have that script in the right box? I have no such thing. Highlight the "send to evernote.scpt" and hit the " - " below that box. As for version 2.0 of my workflow, HERE it is. Keep in mind each time you login you will need to be sure Folder Actions are enabled. I couldn't figure out how to do that with this workflow (yet). Once you enable it when you login, it will work fine, though. I downloaded the workflow. The workflow requires folder options to be enabled right? Now to enable that I followed the steps posted by the OP. When I follow those steps is when this script gets attached to the folder in question. In summary, here is what I did. Created a new folder in Documents folder. Enabled folder options on that folder. Attach script which I saved in Library/scripts/folder options script. Then I copy a pdf file in that folder and wait for the pdf to be magically imported into evernote. Okay, here is what I did step by step. Nothing left out. Nothing simplified. 1. Copy code from this thread. 6. Save script in Macintosh HD>Library>Scripts as "Evernote Auto-Import"
7. 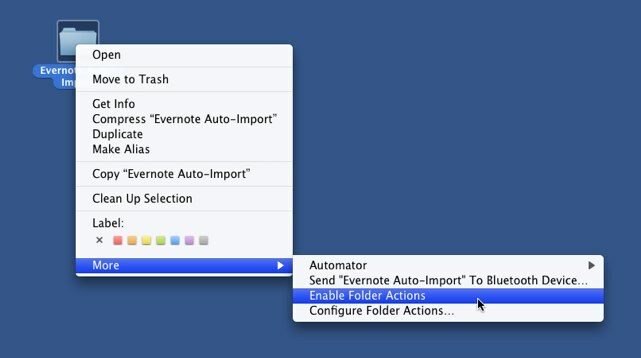 Make folder in Home>Documents called "Evernote Auto-Import"
10. Select the "Evernote Auto-Import" script. 11. Right-click the folder again. 13. Close that window that pops up. 14. It should work now. THERE MAY BE SOMETHING MISSING BETWEEN 10 AND 11, I AM NOT SURE. P.S.- I see where that script in the right-box comes from. I only get it when I select the script in the left box. Also, mine has the same title as the script on the left. As for my problem with needing to re-enable the folder actions with each login (so every time I login I have to re-enable them), I went on to Apple Discussions and seem to have found a solution. And then logout. Then log back in-add the folder actions (if you need to) again, and then you should be good. I did a quick log-in log-out test to be sure, and it seems to have worked. my auto import also works now. thank you! Thanks to red_menace and V.K. for their help (on Apple Discussios). I have finished version 3 of my Automator script. It no longer quits Evernote (due to some new information...something was wrong with my system so I thought this was necessary). 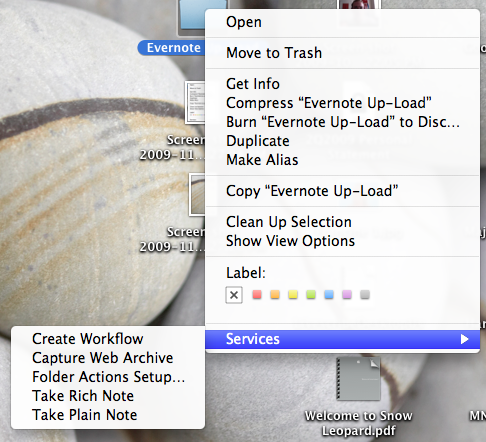 It also no longer attempts to open the Evernote Auto-Import folder in Finder (not necessary). @Lougoose would you be able to re-post your automator script? Seems like the link no longer works :-( thanks and looking forward to using it! As for version 2.0 of my workflow, HERE it is. The link redirects to the home page of www.filedropper.com. Can you please repost it? Or PM me with a new location? Thx in advance. Yeah, if someone could repost a link to the latest script (looks like version 3) it would be much appreciated. The current links just point the front page of FileDropper. Thanks! Is it possible to modify this as a print-to-PDF script so that I can save PDFs to a folder besides the default folder? I am a relatively new Mac user and have not been able to quite fully make the adjustment from PC. When I try to follow your directions I am unable to find the "Enable Folder Actions" option. When I right-click on the desktop folder the options I see are included in the attached screen shot (I couldn't figure out how to paste it into my post. Did you try "folder actions setup"? I may (and probably am) missing the point here, but how is this different to just dragging the file onto the Evernote icon in the dock? If you're dragging a file, then this is basically the same thing. It can be useful if you have some application (e.g. a scanner) that drops files into a folder, however. This may save you a step. Should this script work in Snow Leopard? At the point of compiling, I am getting an error message: Expected end of line, etc. but found application constant or consideration. At that point, I can't save it as a .scpt. 1. My PA puts the document on the scanner and then presses the Scan button. 2. The document is saved into a folder, at which point the application Hazel moves the file to the folder where your script is run as a folder action. 3. The script works perfectly and sorts the file into the Clip Successful folder. All that is hunky-dory, my problem is that my scanner software only lets me use the same name for each document scanned, if I want to do it automatically that is. There is is no way to sequentially outnumbers to each document. This means that when your script sorts the file into the Clip Successful folder, if the file already exists, it overwrites it. I would like to keep a copy of my documents separate from Evernote, so you can see why this behaviour would be a problem. Is there any way of modifying the script so that it avoids this problem? Just FYI, the reasonable needs to be automatic is that I am quadriplegic and therefore cannot fill in different details for each document on a document like document basis. could someone repost a link to download the latest script? looks like the last one expired... thanks! Questionon location in evernote & note title. I was able to edit the script to remove the Auto Import part of hte title but I can't see how to use just hte filename as a title. Is it possible? I see this was asked earlier but no answers I could see. Second issue, Is there a way to tell evernote where to put the resulting clipping? i.e a specific notebook? is there anyway someone could re-upload the latest version and post a d/l link? the links here seem to be expired. thanks! Veritrope - do you have a version that would just add to a pre-assigned folder (set within the script) or to the default folder but without the requirement of user input via the dialogs? i have someone adding docs for me via a synced Dropbox folder and I want these docs to go directly to Evernote even when I am not around. You can just call me "Justin"! I don't have a version like that but, as always, I am happy to tailor scripts to individual workflows. I'll take a look and get back to you with an estimate. Back to the published script for a moment -- I've been getting a lot of downloads, but not a lot of comments. Anyone else try it? Thoughts/suggestions/etc. are welcome on the script's page (link in my earlier post), on Twitter, or via the Veritrope.com Contact page! There are some good scripts here. I made my own to fit some custom requirements I have. I use Evernote & Dropbox on my iPad and iPhone quite a bit. I also use GoodReader and a few other apps that sling files around that I want to keep in Evernote for various purposes. I've set up my Mac to run this Folder Action everytime it sees a file in my Dropbox's "Import to Evernote" folder, so wherever I am I can import directly into Evernote regardless of file type to Evernote, then it is there and I can use the iPhone/iPad client to edit the notes to my specifications (e.g. I can add any file type, etc from GoodReader using its any web url download capability on the iPad or iPhone). It also detects if Evernote is running on my Mac, if it is already running does leaves it running when it is done, if it has to launch it, it closes it, so it cleans up well after itself (it also deletes the file out of the hot folder). Works really well for what I want it to do. YMMV. Download the Folder Action from https://www.dropbox.com/s/73wvlz0qq6ykgg0 and edit/assign it to the appropriate folder you'd like to be the hot folder. To take this one step further, is there a way to designate the notebook in which the note will be created in? Did you look at Veritrope's link? First, the post you quoted was posted primarily as spam b/c of the links included in the post (and that you included in your quote) and has been deleted. Second, I've perused this thread & don't understand what "basic" feature you're saying isn't supported. Admittedly, I didn't read every detail, but AFAIK, import folders are supported on Mac. If they are BnF, I can't find them. Nevertheless, it looks like Veritrope's script does exactly the same thing. Ah, my bad. (Sorry!) Thanks for the correction! I left Windows for Mac just to avoid this sort of roll-your-own solution, and my guess is that the EN developers recognize this and will bring the Mac version up to the Windows capabilities pretty soon. After all, auto-import is more or less the default method of getting scans into EN Windows. I just switched from windows to mac recently and I must say that I'm utterly surprised this feature is not existing in the mac version... is there any plan to introduce it soon? The nice thing about AppleScript is that it's pretty easy to make it do **EXACTLY** what you want it to do! For future revisions of the script, I'll probably include some "switches" to make customization even easier.... but hope this helps for now! yeah, I know I know... yesterday evening I spent a couple of hours playing around with your script! But the thing is, I just feel I'm starting to go back to my linux days seeking Evernote for Mac to enable me do things that Evernote for Windows actually does out of the box. What I want to say is that you can get really far with scripting, I know (have used debian for years), but I feel somehow that Mac users in this case have been left out for this and other features should be provided by Evernote itself. I have edited Veritrope's script"
The file will quietly copy to Evernote without need for your intervention. What they SHOULD have as the note title is just the first line of text in the text file. Can't you change that line so that instead it picks up the first line of text? Is there a more recent set of instructions on how to import bulk Mark/Space files for Mac? I have been using your script very successfully. I have an @Evernote folder which now automatically adds content to Evernote. Great. I have set up a folder for a more specific purpose. It is called "@PHOTOS Evernote" and I would like to upload photos to Evernote using this folder. How can i amend the script to ensure that the folder contents go direct to a folder called "---PHOTOS" in Evernote and do not have the @Evernote tag.